I met with my sponsor Victor Sanchez, owner and operator of Sanchez Stucco and Stone. I call him dad. 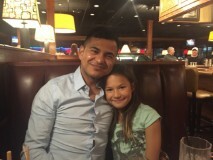 We talked about my experiences as Little Miss Inver Grove Heights over dinner at Ruby Tuesday. He is very proud of the service work I have done. I told him about the exciting events I have attended and the money I raised for the Walk to End Hunger. It was different to have such an official meeting with him. I let him know how much I appreciated everything he has done for the Program and myself.